CD243 antibody recognizes multidrug resistance protein 1, also known as ABCB1, P-glycoprotein 1 or multidrug resistance protein 1. This antibody has been extensively validated for western blotting using whole cell lysates. Mouse anti Human CD243 antibody recognizes the CD243 antigen, also known as multidrug resistance protein 1, P-glycoprotein 1, colchicin sensitivity, doxorubicin resistance and multidrug resistance protein 1 and ATP-binding cassette sub-family B member 1. This membrane-associated protein, encoded by ABCB1 gene, is a member of the superfamily of ATP-binding cassette (ABC) transporters. ABC proteins transport various molecules across extra- and intra-cellular membranes. ABC genes are divided into seven distinct subfamilies (ABC1, MDR/TAP, MRP, ALD, OABP, GCN20, White). This protein is a member of the MDR/TAP subfamily. Members of the MDR/TAP subfamily are involved in multidrug resistance. The protein encoded by ABCB1 is an ATP-dependent drug efflux pump for xenobiotic compounds with broad substrate specificity. It is responsible for decreased drug accumulation in multidrug-resistant cells and often mediates the development of resistance to anticancer drugs. This protein also functions as a transporter in the blood-brain barrier (provided by RefSeq, Jul 2008). 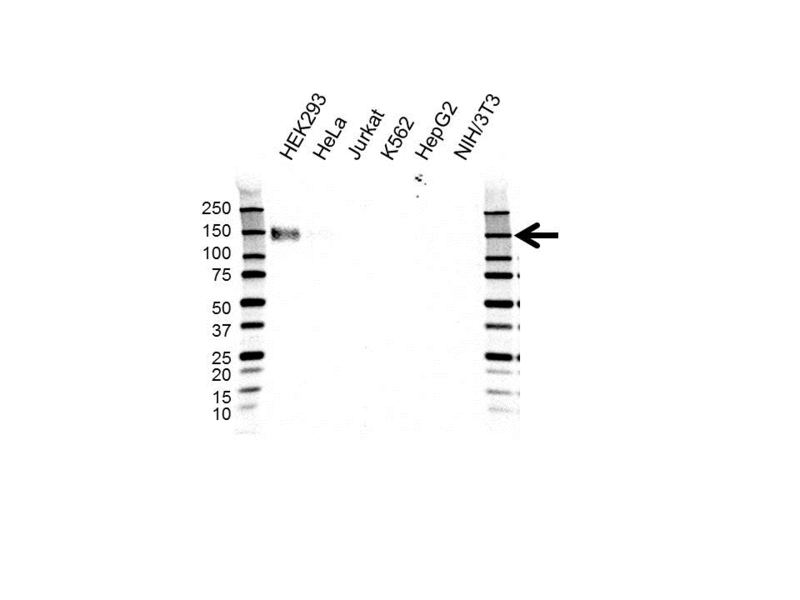 Mouse anti Human CD243 antibody detects a band of 141 kDa. The antibody has been extensively validated for western blotting using whole cell lysates.